Until several years ago when talking about Gunungkidul regency, Yogyakarta, most people would probably have thought of a barren, dry and economically poor region suffering from recurrent clean water scarcity. This is no longer the case. Gunungkidul is currently a popular tourist destination offering mostly natural beauty. It is also rich in Javanese culture where traditional performances and rituals are still well preserved. Clean water supply is also no longer an issue as new resources have been developed to answer the problem. The natural beauty on offer ranges from exotic beaches, rare views of a karst mountain range, a prehistoric river and mountains, geoparks, challenging caves to explore, rocky routes to adventure and attractive spots to take pictures in. Even the meandering, up and down, roads in the hilly area heading to the tourist sites are no less interesting. During the rainy season they offer beautiful green views of mostly teakwood forests. During the dry season they offer exotic views of grayish, almost leafless teakwood trees along both sides of the roads. In some sections, like the one on the route that connects Gunungkidul regency's Panggang district and Bantul regency's Imogiri, travelers are spoiled with the view of karst cliffs on one side and the distant view of the blue Indian Ocean on the other. Economic observer Cyrillus Harinowo Hadiwerdoyo once called this particular section the Monterrey of Gunungkidul, because he sees it as similar to the road section called Seventeen Mile Drive in Monterrey, California, in the United States, known for its beautiful meandering route that follows the contours of its mountain range area. “Gunungkidul is extraordinary,” Harinowo said during his visit to the regency recently. He said that Gunungkidul as he saw it had been transforming itself from previously one of the poorest regions in the country into a favorite tourist destination. “And this is just a beginning,” said Harinowo, expressing confidence that within the next five to 10 years Gunungkidul will really transform into a New Bali. Providing an example, he said that the elite Nusa Dua tourist area in Bali was previously also a barren hilly area. Thus, it is quite possible that the hilly karst area of Gunungkidul will also be transformed into an elite tourist destination in the near future. The current development of Java Island’s Southern Route (JLS) that also directly connects Gunungkidul’s coastal area with the New Yogyakarta International Airport (NYIA), planned to start operation next year, will further speed up the transformation process. He said it was this confidence that moved him to jointly invest in the tourism sector in Gunungkidul by developing the Radika Paradise Hotel at Indrayanti Beach with a local investor, offering cottages and villas for overnight stays. “The response has been beyond our expectations,” he said, describing how foreign and domestic tourists had started staying in his hotel even though some facilities of the hotel are still under construction. 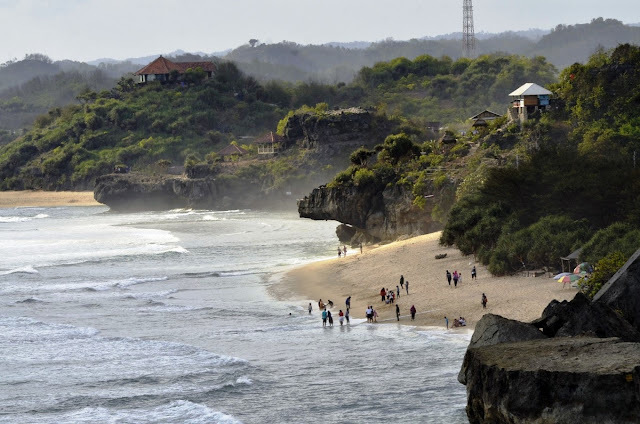 Gunungkidul Tourism Agency's planning sub-division head Supriyanta concurred, saying that the regency had for the last few years been enjoying a steady increase in tourist visits by up to 400,000 a year. Last year it had 3.2 million tourists visiting, of whom 21,600 were foreign tourists. He said the majority of tourists visiting Gunungkidul so far chose the beaches as their main destinations. Among the most popular beaches are Baron, Kukup, Sepanjang, Drini, Krakal, Sadranan, Ngandong, Sundak, Indrayanti, Nglambor, Siung and Wediombo. Each offers distinct charms and characters. “We have a target of promoting four new beaches a year,” said Supriyanta, adding that of the regency’s 121 registered beaches, only 40 had been developed and exploited as tourist destinations. To help attract more tourists, the regency administration is currently building a central parking lot on 3 hectares in Krakal where visitors are expected to park their vehicles and continue their trip to the beaches in shuttle buses provided by the authority.